Nobody likes needles. Whether you are a tough guy or a little kid. Needle free insulin injections are a safe and pain-free solution for people with diabetes and are simple for both adults and children to use. With the Comfort-in™, the needle-free insulin is pushed through a micro-orifice into the superficial skin cells to the tissue below. This is achieved by using a precise measurement of pressure at a fraction of a second without the pain and fear associated with needles. Discomfort or even anxiety related to regular insulin injections by needles belong to the past now. Irrespective of whether you are changing from an oral dose of medication to insulin therapy or have had to inject insulin several times a day for a long time, with the Comfort-in™ you can inject insulin in a tissue preserving way and avoid possible scar formation from daily needle injections. With this reusable injector, the insulin is pushed through a micro-orifice with precisely measured pressure between the superficial skin cells into the tissue below, in a fraction of a second. And this method is virtually painless, tissue-preserving and without the risk of injury. Infections resulting from needle stick injuries are likewise ruled out. The use of needle-free injections constitutes an important method of delivery for medicine and other injections. Many diabetics have been successfully treated with needle-free jet injectors, which are effective in enhancing compliance with therapy, particularly when multiple doses of insulin are required. Comfort-in™ has been proven in this test of Diabetes Control and Complications Trial to more effectively reduce hyperglycemic peaks after meals than an insulin pen without increase or sudden decrease in hyperglycemic episodes. How to use Comfort-in™️ Needle-Free injections, from charging the injector to loading medication into the disposable syringes and injecting safely. 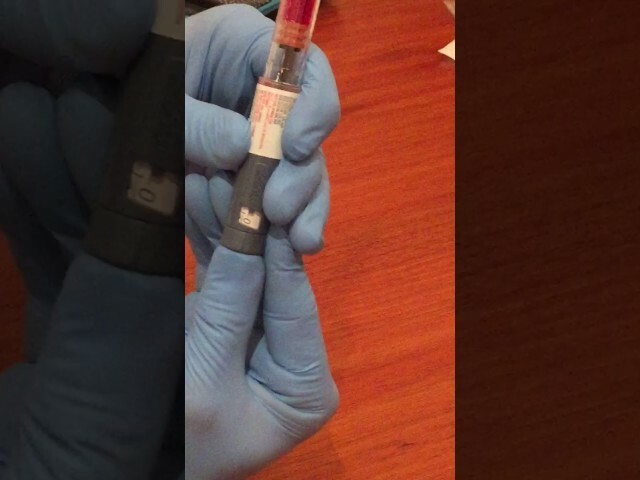 Comfort-in™ pen adapter used with a red liquid in the demonstration insulin pen showing how insulin would be transferred into the Comfort-in™ needle-free syringes. Using the Comfort-in™️ jet injector for insulin Without Needles. With the Comfort-in™, the needle-free insulin is pushed through a micro-orifice into the superficial skin cells to the tissue below. Cross-matches for bioequivalence evaluation division using needle-free jet injector (Comfort-in™) and conventional pen type syringe. Improved pharmacokinetic and pharmacodynamic profile of rapid-acting insulin by using Needle-Free Jet Injection Technology. Jet injection in gestational diabetes.